1. Choose 4 keys for the inside ring and 4 for the outside ring. 2. For the inside ring, cut a 24" (60.96 cm) piece of cord. 3. Tie a key to one end of the cord and wrap the cord around the inside metal ring. 4. Leave 10 inches (25 cm) of cord above the ring for the wind chime to hang from. Wrap the remaining cord around the other side of the inside ring. Tie a key to the end of the cord hanging below the gear. Repeat the steps above for one more cord with one key attached to each end. 5. Cut 4 pieces of cord between 5-7 inches (13-18 cm) long. Tie one end of each cord to a key and the other end to the outside ring of the gear. 6. Make sure the keys are at various heights, but are able to come in contact with one another. Adjust keys around the rings as necessary to keep the wind chime balanced. Hang the wind chime on a Command™ Outdoor Medium Slate Terrace Hook. 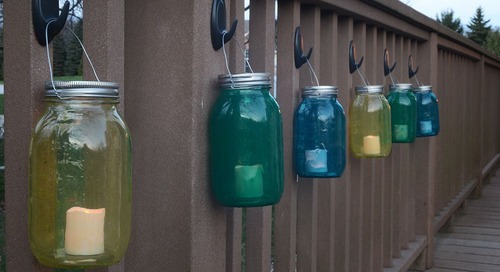 Add some glowing lights to your next outdoor gathering with these beautiful lanterns! Just a few simple supplies are need to create them and a few Command™ Outdoor Medium Slate Hooks to hang them.